Between April 8 and April 17, 1867, Tinco Lycklama travels the region south of Baghdad. He explores the ruins of Babylon, the ancient city that traces back to 2300 BCE and conjures the names of Hammurabi and Nebuchadnezzar. One can easily understand the eagerness and curiosity of a young man to go and see for himself the place where once stood (it is rumoured) the Tower of Babel and one of the seven wonders of the ancient world – the Hanging Gardens. And, for the first time, Tinco also goes digging. Was Tinco’s visit to Babylon exceptional? There is almost no mention in the history books of Tinco’s short exploration of the ruins. Also, the many finds that he took home (206, no less!) have been largely ignored by modern scientists. Or, better put: just forgotten. 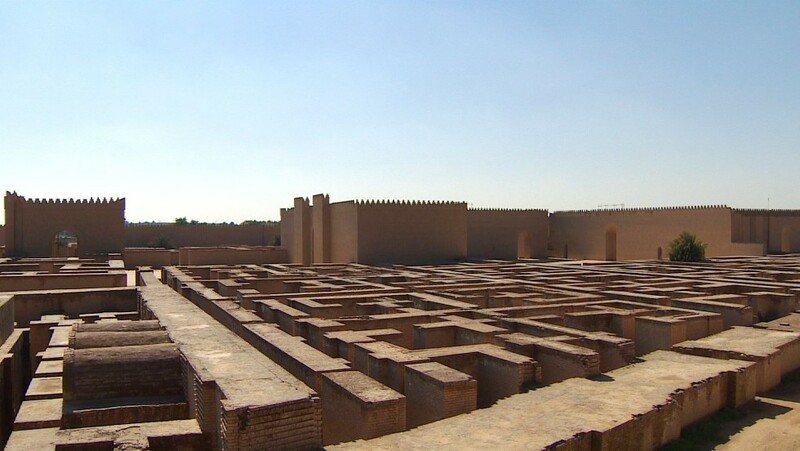 In 1983, Saddam Hussein started building a dubious reconstruction of Babylon on top of the old site. The earliest scientific excavations only started under Hormuzd Rassam in 1879, and took serious shape from 1898 onwards under German archaeologist Robert Koldewey. Previous digging – including Tinco’s – merely touched the surface. 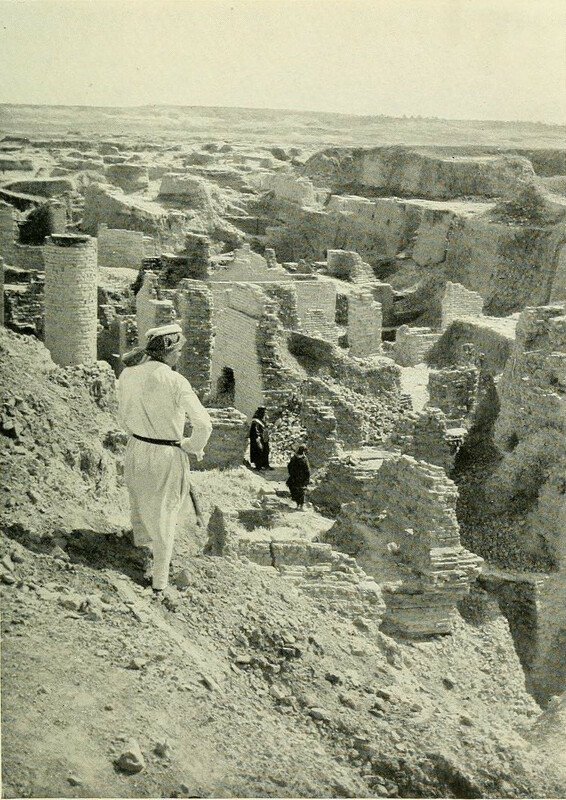 A 1906 view of Babylon, reflecting how Tinco Lycklama must have seen it. The excavations of Babylon by Robert Koldewey (after 1898). Reconstructions of Babylon under Saddam Hussein, after 1983. One must consider the sheer size of the site to understand the challenge of undertaking excavations. The old Babylon probably covers an area of about nine square kilometers. Prior to 1898, one could only observe shapeless mounds of rubble. For centuries, it was assumed that ‘something was there’, but the knowledge about Babylon was derived from indications on objects found elsewhere. The exact location of Babylon was not known. The 17th century traveller Pietro della Valle was one of the first to assert (in 1616) that this was the site of the famous Babylon mentioned in old scriptures. The Frenchman Joseph de Beauchamp visited the site in 1784 and offered more precision and encouraged later explorers to have a closer look at this particular site. The first to undertake some primitive digging here was Claudius James Rich in 1811. Prior to Tinco Lycklama, only ten other people undertook archaeological explorations at Babylon, of which seven in the 1849-1854 timeframe. After 1854, Tinco was the first to visit the site again, in 1867. In his personal library, which he donated to the city of Cannes, we discovered that he had well prepared his exploration of Babylon, collecting the books published by earlier travellers such as Henry Rawlinson, Fulgence Fresnel and Julius Oppert. In fact, to undertake his digging, Tinco recruited the same people that had been working for Henry Rawlinson in 1853. None of these earlier visitors were ‘archaeologists’, as the science as such did not exist. They were usually called ‘antiquarians’ – people studying and collecting antiquities. They brought the first artefacts from those sites to Europe and thus started the primitive collections of some of the world’s most reknown museums. Tinco Lycklama was the only ‘private’ traveller, and he liked to call himself modestly ‘un simple touriste’. He was digging and buying artefacts for his personal collection (which, eventually, became a museum which he donated to the city of Cannes). Perhaps the fact that Tinco Lycklama was travelling on his own, without a commission from a government or other institution and paying for his own expenses, was the reason why official records and history books barely mention him. Tinco was not equipped to carry along large objects. Keep in mind that he was on a three-and-a-half year journey through the Middle East, and that he wanted to collect ‘souvenirs’ from many places. Though he organised the temporary warehousing and subsequent shipping of objects through local merchants, he had to be practical and focused on smaller objects that were easier to handle. Having said that, his collection of 206 objects from Babylon is significant in number, and certainly unique for a private traveller in that time period. A few objects were considered extremely rare and were studied by experts during Tinco’s lifetime. But, the vast majority of Tinco’s collection requires further research by experts. Posted on April 9, 2017 April 9, 2017 by George HomsPosted in Collection, Tinco explores Iraq - November 1866 / June 1867, VoyageTagged Babylon. Previous Previous post: Tinco sails his quffa through the streets of Baghdad. Next Next post: At Babylon, one object could have changed Lycklama’s destiny.